San Francisco's Traditional heavy metal doomers are back with another great release this month! I saw them play like two years ago in my hometown and they were badass! The last gig I couldn't attend for some reasons unfortunately. But i have a grip on their latest album called "Deal Thy Fate." It's not that much of a long opus but still a quality proof. "Can't Escape the Evil" is written with SLAYER in mind. The vocals are great nice weird harmonies, creating a strange effect on the song like if it's wrong or unusual. Mat Davis shares the singing duties some little shots and it gives a masculine, testosteronicalicious singing which contrasts with Ms. Blackwell's voice. An excellent old school metal feel can be heard through the song…very promising! "Skull in the Woods" is much more melodic. The solos are offered here and there…not shredding invocations but great and short passages. We have good edgy riffs too. It's an excellent rhythmic song with crafty elements of vintage metal while doing it in 2018. The vocals are overwhelming and there is inspired riffing that makes you wanna climb and master that mountaintop and yell at this mad world. "Prelude" is a 30 second instrumental that let us breathe a little between two powerful assaults. The time needed to go to the fridge grabbing a can or two and get back smiling, ready for more. "Hexenring" is more mid-tempo. The guitar work and sounding a little different…melodic and more rock than metal. A great solo made me headbanging smoothly. This one is vocals and lyrics powered more then everything else. The solos are poured down at great moments. I really dig this song, and it's quite original. "Wait for the Dark" is more traditional doom with mid to fast speed. The drums bangs the nails firmly, Mat sings a little more on the one. I like the contrast of the two voices, one gaining much higher and more harsh while the other one is more deep almost growling. It's very inspired and authentic metal. They evolved into something more of a beast or like the eyes that lurk in the night, with darkness and intensity. 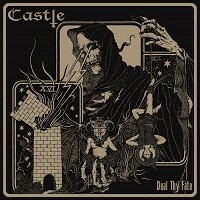 "Deal Thy Fate" is the title song. It's an ultimate mix of all it takes to create a monster. Killer vocals once again, awesome energy and tremendous production. You cannot ignore them. The vocals harmonies have a more 80's touch. This is well written, very prolific. CASTLE has much to deliver and they do it like the masters they are! "Haunted" is very rock oriented, reminding me of an angrier Joan Jett. This is the perfect to listen to while riding. There is heavy riffing, along with a great sense of melody and in your face lyrics. "Red Phantom" is moving, again some obvious SLAYER influence can be heard. In "Firewind," I have to ask myself if Kerry King or Jeff Hanneman possessed them while writing songs? The song takes another direction into clean guitar, not that much drumming, and it's almost quiet. Again a more rock approach, not the cheesy way but rather good pure old rock, a nice way to end this great journey. I'd like to mention that the cover artwork is incredible and very evocative… a reaper and tarot cards (the devil, death, the tower and the hanged man).